The Grumpy Elf: Garrisons: How to Get Nat Pagle as a Follower? This post in one in a series of posts that will be in regards to garrisons and professions in Warlords of Draenor and how they interact with each other, and on their own. Of all the followers you can get to work with and for you in your garrison only one follower in particular would be considered beneficial to get more than the others and that is Nat Pagle, famous angler, because he is more than just a follower. Each profession building can have a follower with the profession skill work there to give you some sort of added bonus from the building itself but Nat Pagle is a unique follower in the fact that when he is assigned to work at the fishing shack, he does not give the fishing shack an added bonus, he himself becomes the added bonus. So while I will not be doing any other singular spotlights on followers for these guides this one follower, thanks to him being unique in the sense that is he is the bonus instead of activating the bonus, is well deserving of a post all on its own. Not to mention, unlike all other followers, this follower requires a lot of work to get and a guide might really help some. How to get Nat Pagle as a Follower? A fishing skill of 700. A level 3 fishing shack. The first three things should be easy enough to attain as completing the draenor angler achievement will not only grant you the achievement, but the ability to open the level 3 fishing shack and you will easily be a fishing skill level of 700 by the time you complete it. The forth thing will be easy enough to complete and will be given to you once the other three are completed. So lets start at the beginning, getting the achievement for Draenor Angler. Draenor Angler is a meta achievement that requires you to complete 7 other achievements to attain. I have done this whole process on the beta and while it does seem daunting reading the description of the achievements involved, it really is not half as bad as it seems to be. Even less so if you actually enjoy fishing, achievement hunting or really want the worlds greatest angler as a follower. 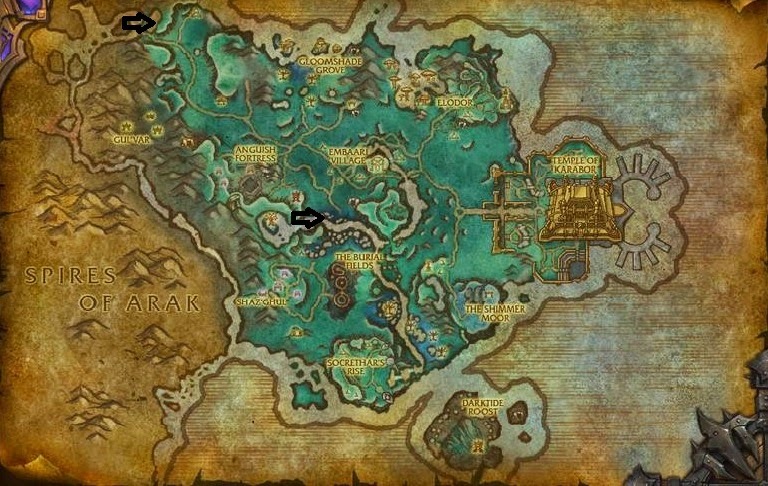 All achievements needed for the draenor angler meta require you to catch 100 enormous versions of the fish in question, so a quick over view of how fishing works this expansion would be beneficial. Each type of fish has multiple catches related to it, for this example I will use the sea scorpion. You will come across sea scorpion bait, small sea scorpion, sea scorpion, and enormous sea scorpion. The bait will help you with catches in open water and can be fished up in the zones where those fish are found, as well as in your garrison waters. The enormous versions are the ones we are interested in mostly for this achievement however. The chances to catch an enormous fish are based off of your fishing level. Be aware that even if you have a 100% chance to catch an enormous fish if you are not using the appropriate bait the enormous catch you will end up with will be crescent saberfish, which is not part of the achievement. Even if you are using bait there is still a chance you will catch crescent saberfish if you are not fishing from a pool. But do not worry too much, the crescent saberfish is needed for many things and can be used and / or sold as you wish later on. To reach those required fishing skill numbers you should consider using what ever fishing boosts you can manage to get your hands on. I had a stack of glow worms sitting in my bank from back in wrath when doing the dalaran fishing daily and they came in handy. Those, along with my mastercraft kalu'ak fishing pole along with my 700 skill level was enough to get my to an 830 fishing skill which did manage to move along with the achievement decently as it allowed me to catch some other things that made it capable for me to get over that 950 mark we were looking for without even putting much work or effort into it. While fishing I managed to fish up some items that increased my fishing even higher. The Ephemeral Fishing Pole increases fishing by 100. It has a 1 day limit to use, which will be more than ample to finish all these achievements if you have the time to spend that day. The pole alone, with some worm supreme with its +200 fishing for 10 minutes, which you will fish up as you are doing this, will get you to 1000 fishing skill easily which is more than ample or guarantee enormous catches 100% of the time. Do not worry if you do not fish up the pole, there is also a hat you can fish up that will increase your fishing by 100 as well, and many other items you can pick up, or already have, that can increase your fishing. So even if you do not snag the hat or the pole, using what you do have with the worm supreme will make even the most unprepared fisherman burn through the achievements in short time. This is a case of once you start, it will only become better. Just remember to use bait, and to fish in the correct places to fish up the fish you are looking for. Tip: Start off in pools. From my personal experience getting the appropriate bait seems easier from a pool. Once you have the bait and use it, it will provide you with a 5 minute buff to catch the fish you are looking for. You will usually catch another bait during that five minutes. You can only hold one of each type of bait at a time, so you can not stock up on it. During the course of the entire achievement hunting only once did I not catch the bait I needed again while fishing in open waters and not pools once I had the bait in those 5 minutes. Where to Catch Enormous Fish? While trying to get this achievement I looked around for the best places to fish. Requirements for me were that my fishing would remain mostly uninterrupted. I will share those spots were I was able to fish without interruption with you. The enormous abyssal gulper eel can only be caught in the spires of arak. Of all the areas this was the hardest one to find a good place for, as there are few inland places to fish in the spires of arak. However, as it turned out, this is the place I found the best spot to fish in. There is a small spot, marked on the map, where you will need to jump down to get to. There are no mobs there, there are no quests there, there is not much of anything at all there around this fishing area and pools do spawn in it as well. This makes it the perfect fishing spot. No foot traffic and no mobs makes for a peaceful fishing place. The enormous blackwater whiptail can only be caught in talador. 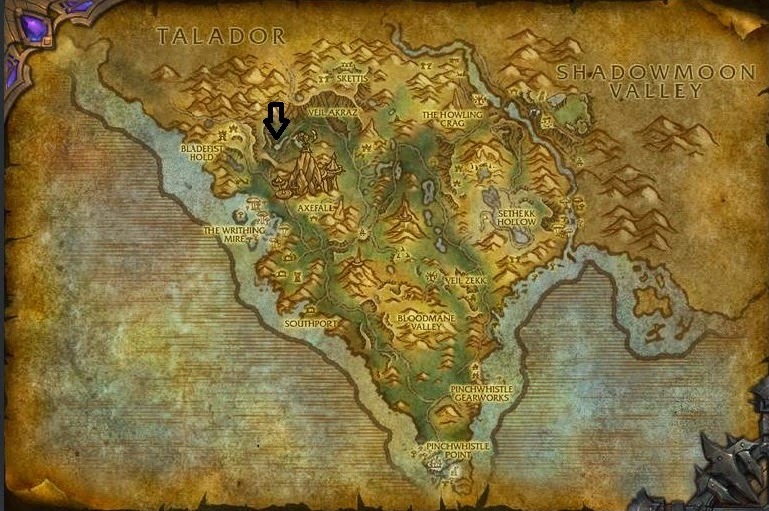 There are many places in talador where you can safely fish, some with minimal interference, some with none. You can feel free to find your own place here as there are many good fishing places. While there are many places you can fish here for blackwater whiptail the above marked place is where I decided to fish because it is near a flight point where I landed when doing these achievements at level 100. There are some hostile frogs there, but based on your level, they will never bother you if you do not get close to them around the fishing hole. No other mobs are near the area and nothing patrols there to bother you as you reach your fishing zen place. The enormous blind lake sturgeon can only be caught in shadowmoon valley. 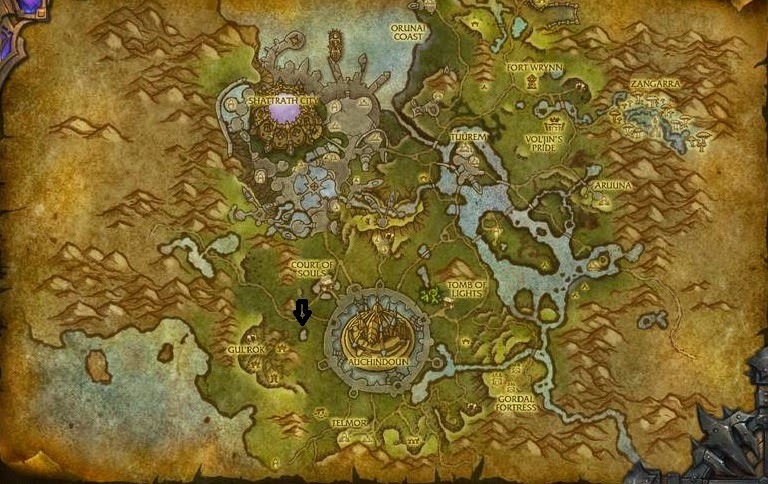 This is alliance territory and as such limits the number of pure safe spots for horde as the best spot for alliance is close to where they originally zone into the zone, marked at the top, the best space for the horde is a little more central to the zone. However, horde can still use the one at the top marker, they just need to be careful where they step unless they want to get into a fight. Don't be fooled with the top area either. Some might look inland but are actually open water. So maybe for both alliance and horde using the middle spot might be easier. 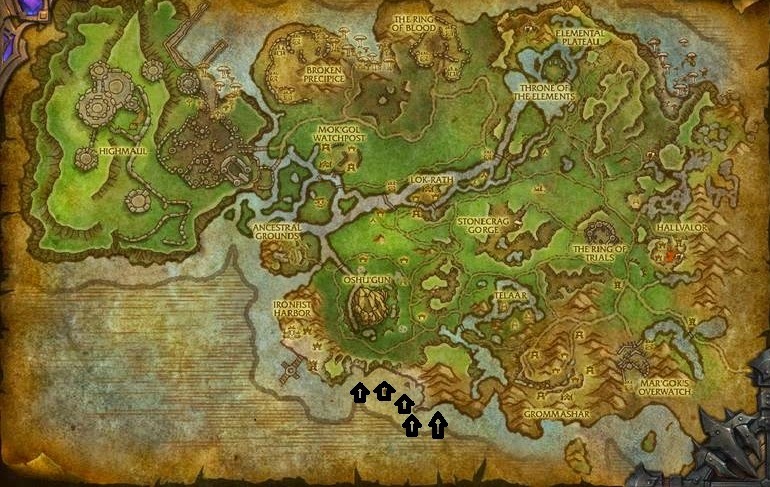 The top marker is the best place for alliance, the bottom marker is the best place for horde. Warning about the bottom marker. There are mobs around that immediate area. My maker might not be perfectly exact as to where the safe spot is. Just walk along the water there, you will know it when you see it. It will be when the quest mobs from one area are to the left of you and the quest mobs from the other quest area are to the right of you, and you are alone without any mobs near you, which is exactly what we look for in a good fishing spot. The enormous fat sleeper can only be caught in nagrand. While there are many places where you can fish for fat sleeper I found what worked as the best place for me when going back to do this achievement was right were a fight path left me off. You might find a place you like better but this one worked well for me. So what makes this the best spot in my opinion? The fact it is exactly is where a flight path is. In a world without flying the less you need to run around the better. Being able to land right here and start fishing instantly made for a very easy achievement. Also, as it is near a flight point and between quest hubs, there are no roaming mobs to worry about. Perhaps the only issue you might run into is clicking on one of the fish that swim around there, but otherwise, this is a great place for fat sleeper. The enormous fire ammonite can only be caught in frost fire ridge. 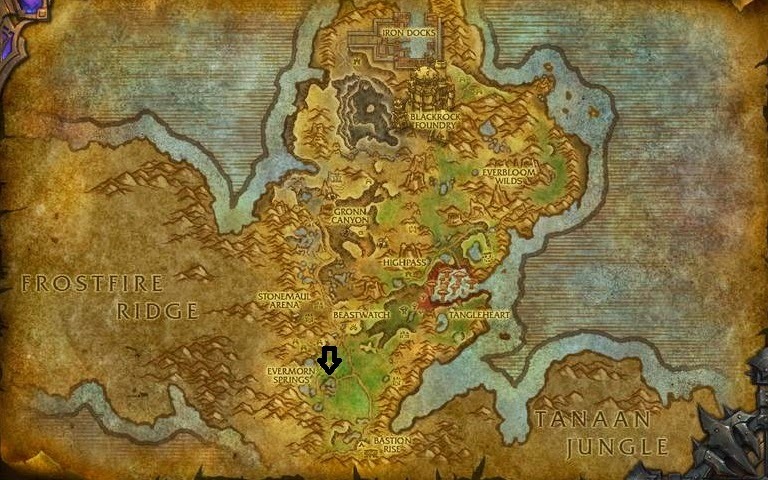 As this is the horde starting area any alliance anglers need to take caution heading over to it. It is not very far from one of only two flight points alliance has there. If you have the flight point as alliance, head to it and walk down, if you don't, while you are there, head north some to pick it up. You will be coming back here for fishing dailies. 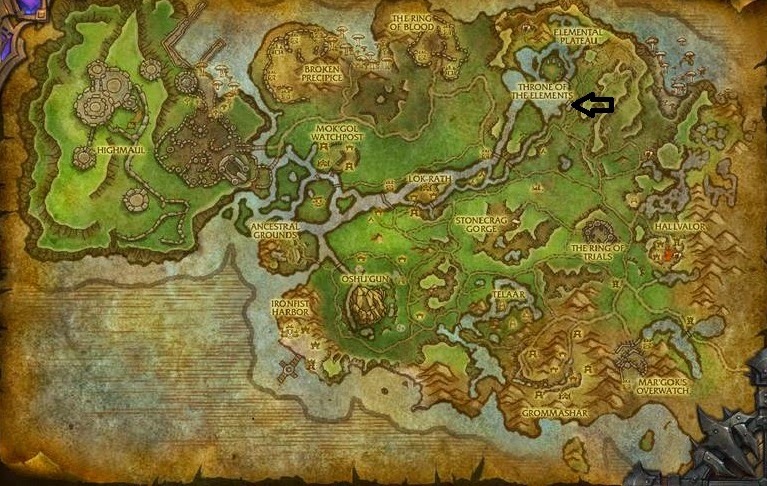 Unlike its alliance counter part where the horde and alliance have different places to fish for the blind lake sturgeon, in frostfire ridge the best spot happens to be the same for both horde and alliance. You will see the rather large skeleton on the map. In the water, right where the arrow is pointing, is a little bit of the skeleton poking out of the water. Standing on that means none of the mobs in the area will aggro on you and you can fish, peacefully, until your hearts content. The enormous jawless skulker can only be caught in gorgrond. As of this writing, this is the only zone in which I could not find a completely peaceful place to fish. There are a couple of decent places however where you will face minimal interruption. The area I pointed out, like many others, is near a flight point. Between both a horde and an alliance fight point, and in the heart of a questing area for both, this will not be a very peaceful place if you do not like crowds. But it is easy to get to, has a few areas in the immediate vicinity to choose from, and even the occasional mob that does spawn will likely be killed quickly by people questing and if not, they are extremely low health mobs that serve as nothing more than a minor distraction. While fishing up my 100 I only got interrupted by a mob 4 times, which when you think about it, is not so bad. Perhaps with some positioning, you could do even better thanks to the level of the mobs compared to yourself when you are level 100. The enormous sea scorpion can be caught in any zone with open water. Unlike all the other fish that need to be caught in inland waters thus restricted to a singular zone this one is not. You can find many places were you can peacefully fish up the enormous sea scorpion and any one will do just fine, but like anything else, I have my favorite place to do so. While there might be many places you can fish for sea scorpion and many places which would be more peaceful, as this area does have the occasional mob you will need to kill, this place or these places as it may be, seem to be the best in my opinion. I found that sea scorpion, probably by process of their location in open sea, have a worse capture rate in open water as you will end up getting enormous crescent saberfish instead of enormous sea scorpion, even with bait active. This area, all along the water, usually will have many sea scorpion pools which will make sure you get the right catch. Having to kill a few mobs here and there while walking between pools makes it worthwhile in my opinion because you will spend less time catching the wrong fish, as could happen in open waters. Once you earn this achievement you will need to upgrade your fishing shack to level three before you can continue on your quest to recruit Nat Pagle. It takes one hour to build, so while it is doing so, maybe you can level up your cooking with all those fish you caught, level your first aid with all those sea scorpion, visit the auction house to sell fish off, or find something else to do. Whatever you do, don't vendor the fish, that is just plain silly. After one hour, when you return to your now level 3 fishing shack, a new quest will appear for you which will start your adventure on getting Nat Pagle as a follower. The idea is that if you are capable of catching a really rare catch that perhaps you can convince Nat to come to draenor and work with you while you fish for these rare catches. Nat has always been known as a sucker for rare catches, but as Nat is a hunter, does it surprise anyone? Once you complete the quest you will receive a follow up quest called Finding Nat Pagle which will send you back to the shores of Pandaria where you will need to go to travel to the Anglers Wharf in the Krasarang Wilds to speak with Nat. Did you manage to become best friends with him while we were in mists? I sure hope you did, because we will need that reputation soon. But if you did not, do not worry, you will be able to get reputation this expansion as well. If you did become best friends with him in mists, that reputation does carry over. Once you show Nat the molten catfish / arcane trout, you will have gotten his attention and he will accompany you back to draenor, but do not get too excited yet, he is not accompanying you as your follower, he is just coming to see what the fishing is like on draenor. The Great Angler Returns is the follow up quest that has you returning to your garrison with a page from Nat's very own fishing book. Once you turn this in Nat will arrive at your garrison and ask you to head out into the world and catch some really rare catches for him. Nat will ask you to go back to all the fishing spots you went before when gaining the draenor angler achievement and get him something even bigger, a better catch. He wants a type of fish called a lunker. Each type of fish you have previously caught has an even larger version than the enormous version you have already been catching, in great quantities. Nat will ask you to return to him with an Abyssal Gulper Lunker, a Blackwater Whiptail Lunker, a Blind Lake Sturgeon Lunker, a Fat Sleeper Slunker, a Fire Ammonite Lunker and a Jawless Skulker Lunker. Apparently there are no Crescent Saberfish Lunkers or Sea Scorpion Lunkers. You can fish these lunkers in the same exact places I suggested you fish the enormous versions up. Or any place you decided on to get your enormous fish from. As I recall it took me no more than 5 casts to fish any of them up. It was quite quick and painless. Once you return to Nat with the 6 lunkers you can complete the final step to getting Nat Pagle as a follower by turning in the quest An Angler On Our Team. This will award you with Nat Pagle as a follower. Being Nat is already level 100 when you get him, you can put him right to work. So what is the big deal with getting Nat Pagle as a follower? When Nat is placed as a follower at your garrison he also becomes a vendor which allows you to buy things from him. Having him as a follower also grants you the ability to catch lunkers on draenor. Without him as a follower working at the fishing shack you can not catch lunkers. Lunkers are good for one thing and one things only, giving them to Nat. Each lunker you give to Nat will grant you 350 reputation with Nat, if you are not already his best friend like you should be, and he will give you one of Nat's Lucky Coins. Nat's lucky coins are used as currency to purchase things from nat, which include a BoA skill boost you can send to other characters, a pet that can be caged and sold, and a water walking mount among other things. Nat's Draenic Fishing Journal: BoA, increases fishing skill by 50 up to 700. Nat's Drinking Hat: BoP, Head, increases fishing by 10, attach a lore of +150 for 10 minutes. Draenic Fishing Pole (A): BoP, increases fishing by 30, attach a lore of +200 for 10 minutes, 20 minute cooldown. Savage Fishing Pole (H): BoP, increases fishing by 30, attach a lore of +200 for 10 minutes, 20 minute cooldown. Reins of the Crimson Water Strider: Mount, walks on water. Depends on the luck of the catch. It took me around 6 hours of total play time to do everything, catch all fish and do all quests, including upgrading the fishing shack time. Be mindful that I was already fishing skill 700 when I started however and had some limited progress on catching some of the enormous fish as I managed to snag a few while leveling fishing. If you are a lower fishing level, or have less luck with catches, it could take a little bit longer. That is entirely up to you. I sure think so and I am looking forward to getting both the mount and the pet on live when warlords comes out. Good luck, and may the fish keep biting for you. Thanks GE! Sorry I haven't commented lately - been not doing good. But hopefully I can catch up this week, my friend. Enjoying what I am reading so far. You ever write a book or anything? Hope you feel better soon buddy. And as a matter of fact, yes, I am a published author. Quick question, is this the same faction as Nat in Panda Land? Or is this Nat from another time line? I'm already best friends with him in Pandas, does that count for nothing!? Am I correct that it would make sense to only assign Pat to the shack when you (a) are fishing or (b) want to purchase something from him? Otherwise, giving him some gear and sending him out on missions seems the way to go. I understand that if you are the type of angler that doesn't plan his fishing trips, this might make it difficult to be a spontaneous fisherman. I pretty much know when I'm going to spend time fishing, however, so this seems a good plan to me. Wondering how you use Pat? Yes, he serves no purpose being there other wise. I use him for missions unless I plan on going on a fishing spree and then I put him in so I have a chance to catch lunkers. As you said however, if you tend to spontaneously fish and never actually head out intending to fish having him there all the time would be better. wow great guide. thank you! 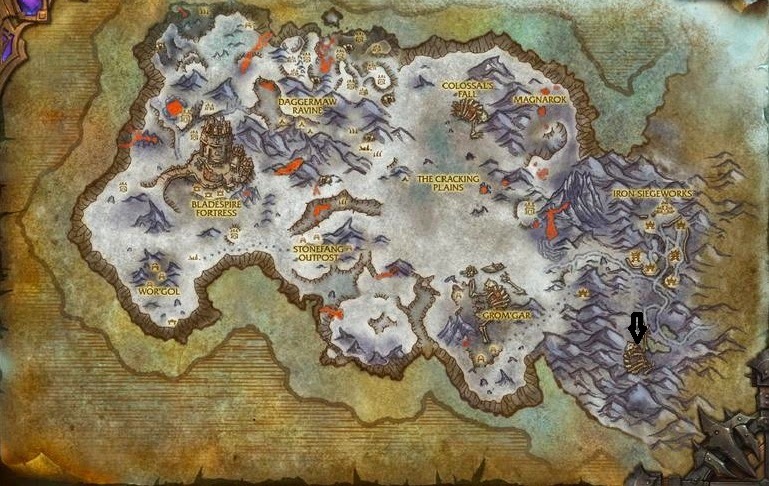 i would like to mention that for alliance who don't want to bother with frostfire ridge for their fire ammonite, there is a lake above hallvalor in nagrand which yields fire ammonite and lunkers. have caught lunkers there and am about to go (on an alt) if i can catch the quest ammonite lunker there as well.. i will keep you posted. ok, so after 25 casts in the above mentioned pond i did catch the fire ammonite lunker for the nat pagle quest. so, if you're ally and don't want to deal with frostfire, this is a good spot. skirt the town to the south hallvalor... go up the hill to the top of the waterfall and theres a lake with a floating duck toy and some goblin beach gear.... lots of steam and bubbles.... and ammonites! Nice catch, thanks for sharing. I have always liked the place by the bones to get them but more alternate areas are always welcome. That might be something people would like even more. as an alliance player, i find it very convenient.... i have been fishing this spot for a couple of months now and have yet to see another player there. no worries about having a low level horde calling in the whole zone to take you out.... of course i play on a pvp server, so this is a big factor. Playing on a PvP server your area is HUGE. I am on a PvE server so there really are not worries for me. I can't really comment on leveling on a PvP server much, think the highest I got was in the 30s, and then they added CRZ and I could not step out of Org or I was dead instantly and I lost all interest in every being on a PvP server again.